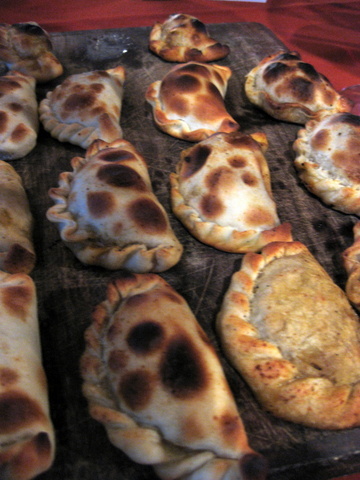 On our travels around Argentina last month, we carried out an intensive benchmarking exercise on empanadas, those cheeky little pastry turnovers with artfullly pinched and pleated edges that you find pretty much all over South America. They probably found their way to the continent via Spain, though they’re quite different from the large tray-baked empanadas found in Galicia, which are usually filled with tuna and sold by the slice. 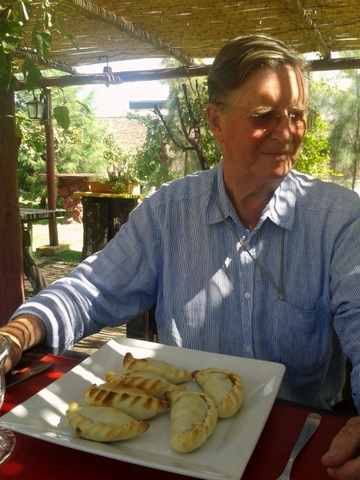 As we travelled around, first in Buenos Aires, then to Mendoza and the winelands and finally gorgeous Salta province up in the northwest close to the Bolivian border, whenever tummies began to rumble and we needed a little sustenance, we went on an empanada hunt. One of the big pluses about making up our own itinerary and travelling around just the four of us in our rented car was the freedom to grind to a halt whenever we a) felt another empanada coming on and/or b) spotted some in a shop/restaurant/winery bistro/village square. We got rather good at that. Early samplings were down on the waterfront in Puerto Madero in Buenos Aires, but things only really started hotting up once we got outside the capital. 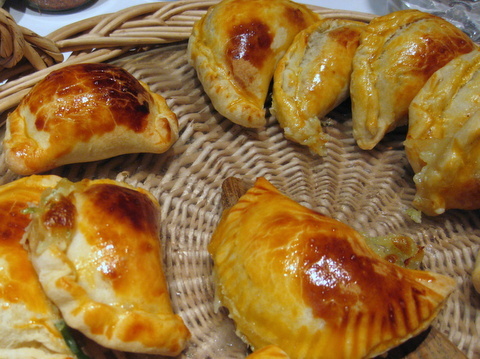 Empanadas mendocinas (from Mendoza, city and wine-growing province) are justly famous. The ones on the left were about the only thing edible at the ghastly Francis Mallmann restaurant – big build-up, big disappointment, the only bum meal of the whole trip. Baked (mildly incinerated?) in their wood-fired oven (one of the ‘Siete Fuegos’ of TV-chef Mallman’s book title), they were slightly redeemed by their accompanying heap of salad leaves – in a land of unreconstructed carnivores, tracking down any kind of salad turned out to be a challenge. In Chacras de Coria we were directed by the lovely folks at our hotel Lares de Chacras to the Pulmary winery just around the corner. Here we found two young chefs stoking up the fire, ready to barbecue the obligatory bits of bife. 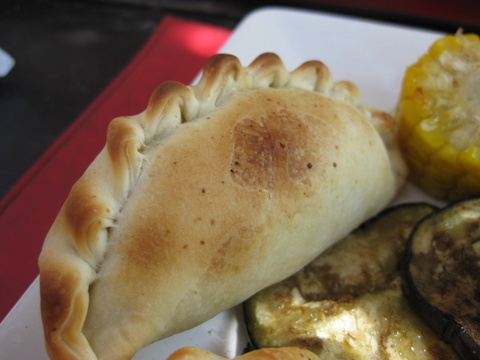 To our delight, empanadas were also on the menu if we were prepared to wait a bit. We were. It was worth it. They had a cheesy filling and oh joy, came with some aubergine slices and corn, also done on the fire. Yum. In Mendoza’s Valle de Uco, after scrambling around vineyards and inspecting newly planted vines with star winemaker Edy del Popolo of Per Se Vines, we adjourned with him (and armfuls of his bottles) for a tasting at the deliciously quirky Tupungato Divino (a place to bookmark: terrific ‘wine list’ chalked up on blackboards on the walls with top drops from the Valle de Uco, and four funky rooms.) To go with Edy’s gorgeous Jubileus and La Craie Malbecs they produced a tray of pastries, some filled with meat, others with cheese and herbs, brushed with oil and baked in the wood-fired oven. 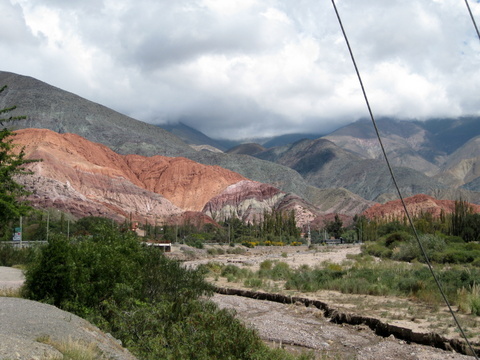 For the final part of our adventure we flew north from Mendoza to Salta, land of dramatic, multi-coloured sandstone rock formations, bone-shaking un-made up roads and dizzying, headache-inducing altitudes (one road took us to over 4000m). 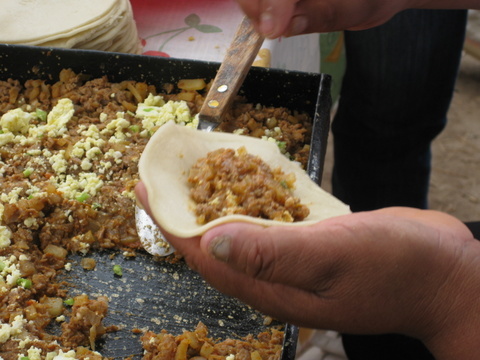 Food bears the distinct and delicious stamp of the indigenous population – it’s both empanada heaven and corn paradise up here – the tamales and humitas, two corn-based delicacies, transported me straight back to Mexico. 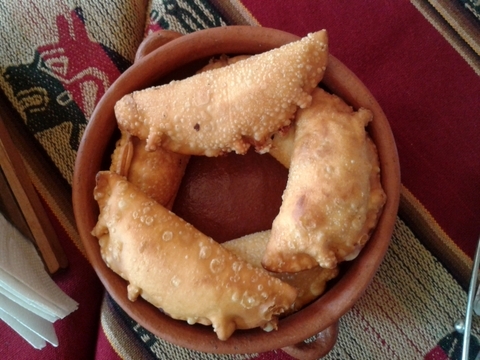 In a tiny hole-in-the-wall kind of place in the village of Purmamarca at the foot of the Cerro de los Siete Colores (above) we met our first deep-fried empanadas, which immediately shot to pole position in the rankings. Sizzling straight from the deep fat fryer, the pastry (bet it had some lard in it) was the finest yet, flaky and fragile and oh boy were they good. 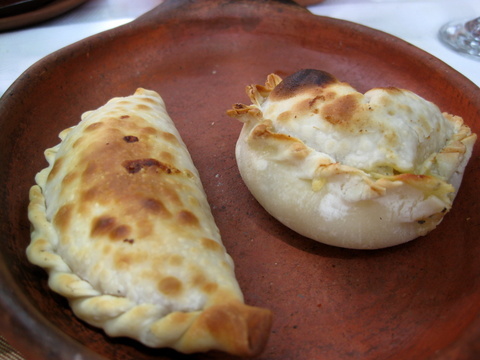 Some were filled with roast cabrito (kid is typical hereabouts), others with cheese and little pearls of quínoa, much used in Salteño cooking, both white and red sorts. 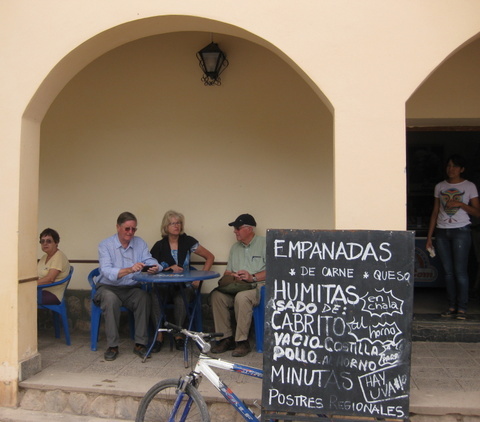 Our final feast was on the main square of San Carlos on the road from Molinos down to Cafayate. It was a public holiday and all the town was out to celebrate in the warm late summer sunshine. 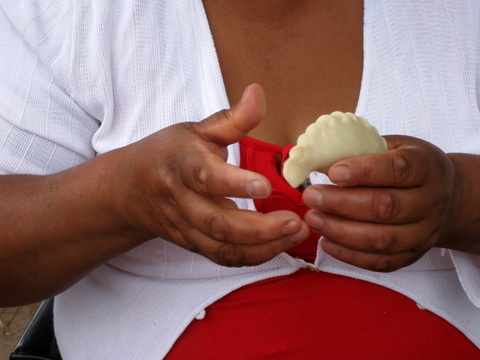 A young woman and her husband had set up their stall making fresh empanadas. 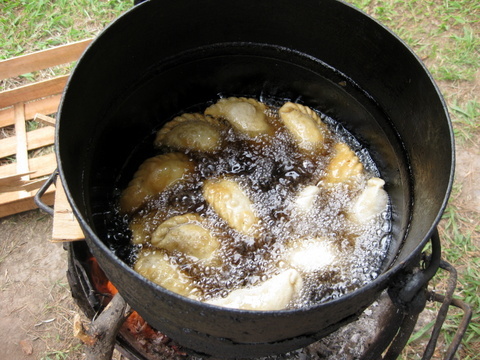 Over a simple fire they had set a large pan full of bubbling oil. I joined the queue for some of the most sensational empanadas yet (yes, deep-fried definitely does it). 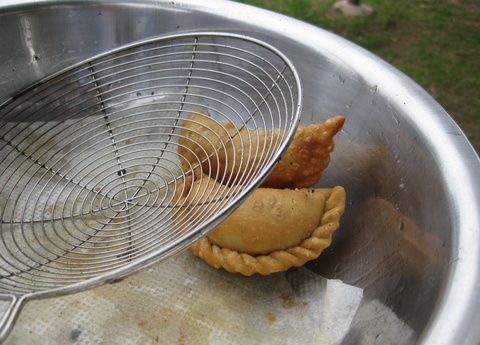 Still hungry for empanadas after all that? Me too…once I got home I set to experimenting with my own, and they got their first outing at my vegetable workshop. Here’s a recipe, which I blush to offer to any Argentine experts out there, as it’s not particularly conventional or even authentic, but we liked the result. I baulked at deep-frying but painted them instead with egg yolk and baked them. We also did some in the wood-fired oven which was fun: the first batch were incinerated a la Francis Mallmann but the second lot were fabulous with a lovely wood smoke flavour. You need surprisingly little filling – not more than a couple of teaspoons per pastry, otherwise they’ll burst open when you cook them. Place the flour and salt in a food processor. Place the milk and butter in a microwafe-safe bowl or saucepan and microwave or heat briefly till barely warm to the touch. Stir in the egg yolk. Pour the milk mixture through the funnel and continue to process only till the dough forms a ball around the blade –If necessary add more milk to make it come together. Scoop the dough out onto a floured working surface, sprinkle with flour and knead briefly till smooth and silky. Cover with foil or clingfilm and refrigerate for at least an hour, more if possible. Fill each disc with about one heaped tablespoon filling (don’t overfill or they’ll burst open), brush the edges with egg white and fold over. Press the edges together firmly with a fork, or crimp them decoratively. 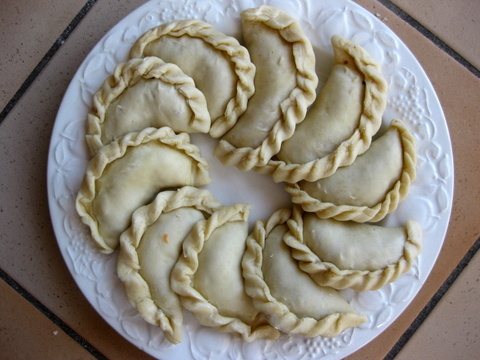 Refrigerate (or freeze) the empanadas till ready to go. Brush with beaten egg and bake in a 200C oven for 12-15 minutes till golden brown (OR skip the egg glaze and fry in hot oil till golden brown and crisp OR bake in a wood-fired oven for as long as it takes (not long at all)). 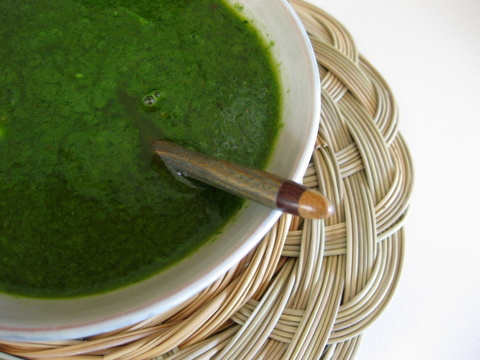 We served ours with a salsa chimichurri, made by blending together a large bunch of flat-leaf parsley (leaves only, about 30g), ½ teaspoon dried oregano, 1 crushed clove garlic, 3 tablespoons white Balsamic or other white vinegar, 6 tablespoons olive oil, salt and pepper and a generous pinch of paprika or chili powder.